Apple has seeded the very first Public Beta Version of OS X Yosemite 10.10.2 (Build: 14C81h) to Mac OS X developers and non-developers (general public) as tester and experimental update. Mac users can install / update / upgrade to the latest available OS X 10.10.2 Public Beta (14C81h) instantly. We are also providing the official Direct Download Links of OS X Yosemite 10.10.2 Public Beta Delta / Combo Update .DMG Files for our readers and followers. Few weeks back, Apple had released OS X Yosemite 10.10.2 Beta 3 (Build: 14C81f) to developers with same features and functionality changes, So Mac users can consider the latest update as OS X Yosemite 10.10.2 Public Beta 4 (Build: 14C81h). The changelog and release notes of OS X 10.10.2 Public Beta includes; Voice-Over, Mail and Wi-Fi connectivity improvements with several bug fixes. 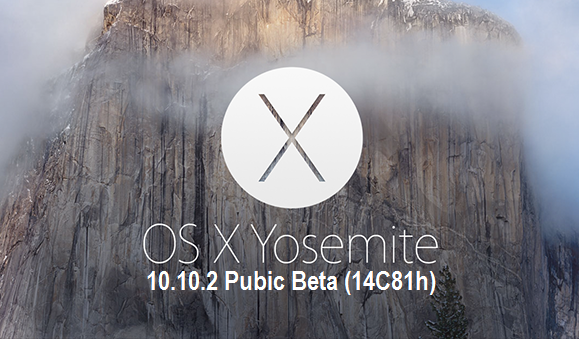 How to Manually Install OS X Yosemite 10.10.2 Public Beta Update? You can get the latest OS X 10.10.2 Public Beta (14C81h) Update through Mac App Store >> Software Update option. If you're OS X developer, then visit OS X Dev Center website, and if you're OS X non-developer (general user), then you can install and activate OS X 10.10.2 Public Beta via iTunes without Apple UDID and developer account for FREE. You can also Download OS X 10.10.2 Public Beta Combo / Delta Update .DMG Files via Direct Links.